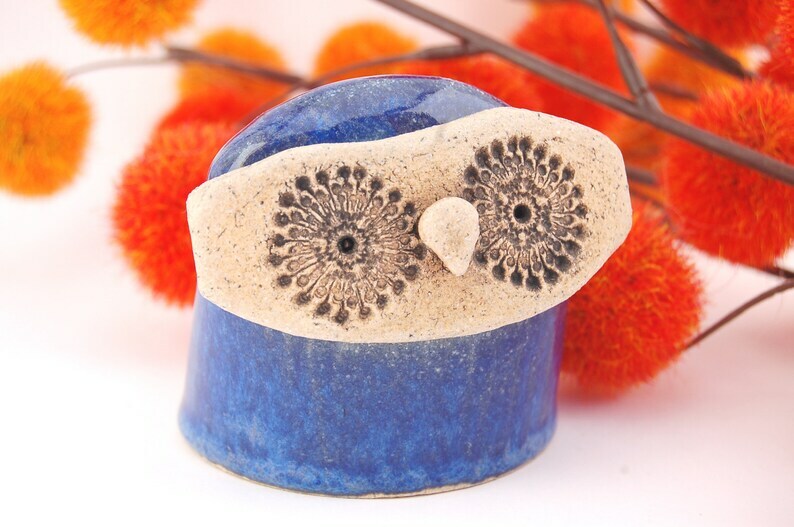 Tammy is a beautiful, bright blue bird of prey sculpture made of a golden stoneware clay. Her eyes are impressed with a vintage button overlaying a round radiating circular patterned rubber stamp. Her back side was textured with the use of a doily and clay fettling knife point. 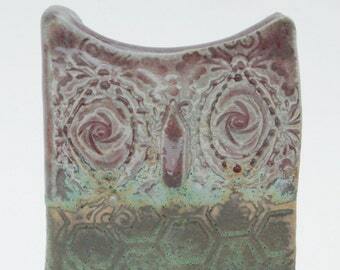 After bisque fire, she was first coated with black underglaze which was wiped away to be left in the recessed areas of her design. A gloss glaze called indigo float was brushed on where smooth and sponged on where textured. Tammy sits on a sturdy oval base shape that measures 2 inches wide by 2.75 inches deep. She measures 3 inches tall. The vividness of her main color is sure to dazzle anyone with a fondness for the color blue.